I love the feeling of coming home after being out in the cold. Cheeks and nose numb from the bitter sting of the elements. Then the front door opens, and there’s that blissful feeling of warmth slowly returning to your extremities. Top it off with a snugly blanket and a cup of hot cocoa. Absolutely perfect. Although not my favorite season, winter is a close runner up. Unfortunately in Florida, there isn’t much winter. The term “snow day” evokes a feeling of envy. When I hear of people being snowed in, having school canceled, I feel serious jealousy. Each winter, I long to move north to a snowy winter land. I grow weary of mild Florida winters. I get giddy when we have that rare cold snap and temperatures plunge to the 20s. I eagerly pull out my scarves and boots and soft sweaters. Northerners are probably rolling their eyes as they shovel their driveways. I get it. Snow isn’t as fun and magical as I envision. It would probably take only two weeks in a real winter scenario to send me back to my flip-flops, crying. That still doesn’t stop me from feeling serious envy toward beautiful snow-filled Instagram feeds. I want a snow day. In Florida, the closest we get is torrential downpours. I do love them, but they lack the magic that snow days seem to possess. When the days grow short and the temperatures plunge, I long to curl up. Disappear under a blanket. Make crockpots full of warm soup. Drink hot coffee. Get lost in a good book. Binge-watch Harry Potter. Being snowed in sounds glorious. Staying put and hunkering down. A day to hibernate in your home and a reason to leave the rest of the world out in the blizzard. Nowhere to be. Time to watch the gentle flakes fall to the ground and marvel at the frozen beauty surrounding you. I think winter is the season for introverts. It’s the time of year when Mother Nature begs us to slow down and curl up. The world around us seems to take a collective breath. Winter is a good time for reflection. It feels like the only time of year when humanity says it’s okay to hole away at home. As much as I enjoy the vibrant colors of spring, I’m always disappointed when the temperatures begin to rise. Warmer days mean it’s time to come back outside. Rejoin the world. The time of rest has come to an end. I may never have the snow day I’m dreaming of, but I do get brief moments of hibernation: cozying up at home on the weekends or, during workdays, coming home to the smell of soup, simmering in the crockpot all day. Those moments warm my heart and refresh my weary, introverted soul. But I still say: Old Man Winter, bring it on. Please go to the websites we adhere to, like this one particular, as it represents our picks in the web. Every as soon as inside a although we opt for blogs that we study. Listed below are the latest web sites that we pick out. We prefer to honor many other internet sites around the net, even though they arent linked to us, by linking to them. Below are some webpages really worth checking out. Usually posts some pretty fascinating stuff like this. If youre new to this site. Hey there! I understand this is somewqhat off-topic however I needed to ask. on a daily basis. I’d lik to start a blog so I can share my experience and thoughts online. Please let me know if you have any kind of ideas or tips for brand new aspiring bloggers.Appreciate it! all my friends, for the reason that iff like to read it then my friends will too. A person essentially lend a hand to make significantly articles I would state. page and thus far? I amazed with the research you made to create this actual put up extraordinary. to get newest updates, therefore where cann i do it please help out. It is not mmy first time to pay a visit this website, i am browsing this siote dailly and get good data from here evbery day. your weblog. You have slme really great articles and I think I would be a good asset. If you ever want to take some of the load off, I’d absolutely love to write sone articles for your blog in exchange for a link back to mine. Plrase send mee an e-mail if interested. Thank you! My spouse and I absolutely love your blog and find a lot of your post’s too be precisely what I’m looking for. Would you offer guest writers to write ontent to suit your needs? You cann’t believe just how so mucch time I had spwnt for this information! Thanks! Wrife more, thats alll I have to say. Literally, iit seems as though you relied on the video tto make your point. This design is spectacular! Youu obviously know how to keep a reader amused. you presented it. Tooo cool! Whoa! Thiis blog looks exactly like my old one! It’s on a totally different topic but itt has pretty much the same page layout and design. Superb choice of colors! Oh mmy goodness! Impressive article dude! Thanks, However I am going through problems with your RSS. I don’t understand why I can’t join it. Is there anybody else having the same RSS problems? find quietrev.com in google. You are out of google’s top 10, so you can’t expect big traffic. My father was career military which means I grew up all over the world. We spent almost 5 years in Alaska and I loved it and still do. Alaska’s a haven for introverts and not just because of the weather, either. There’s such a vastness there, a beautiful vastness. Conversely, I’ve lived in Texas, Arizona and Florida too. No offense to those who love these states, but you couldn’t pay me enough to live in any of them. I love winters. Ugh. I hate summer so much. The sweat, the drained energy. It’s awful. I understand the power outage: we deal with that during hurricane season. Glad you’re able to enjoy the winter season without the work! I love Canada. You truly do have beautiful summers and falls. I’d love to move to Alaska! My fellow Floridians look at me like I”m crazy when I get excited about cold weather. I look at them like they’re crazy when they get excited about hot weather. I totally understand. As I said, it wouldn’t take long in a real winter scenario to send me crying back to warmer weather. Living in Florida, I feel the same way about summer. While a lot of people are craving hot weather and beaches, I absolutely hate the heat that leaves me totally drained and sweaty. I love winter for these reasons. It is indeed a magical season. Love and agree, wholeheartedly, with your sentiment. I, too, look forward to winter–even the city halting snowstorms when you’re strongly warned to “stay off the streets!” The neighborhood is quieter and I have a real sense of peace. I love have no sense of obligation to be anywhere or do anything. To me it’s the best season. This Southern Californian agrees. The jasmine is already starting to bloom and we haven’t had winter yet! I long for an excuse to stay in the house and read, but no, with 80 degree temps most of the “winter” it’s impossible. We’ve only had a few days of rain the entire year. However, I do sympathize with those who endure endless days and months of gray, gloomy weather – I would definitely not do well with that. So yes, the grass is always greener on the other side. I agree, it takes so much out of you to battle the winter elements in a northern climate. As you get older it gets worse yet. Take me with you! I’m with you, Elizabeth. After 2 months now of subzero temps and shoveling snow, I have about had it with our winter in MN! It’s only the beginning of Feb and I find myself bitter, angry at the relentless cold. I long for the day’s of clean cars, clean floors, warm and sunny weather where my dogs don’t struggle to go outside….there is so much work involved in living in a harsh climate like this. Bah Hum Bug….I’m going south! Jamie: your essay is a wonderful reminder of why I choose to remain up north in western Wisconsin. After 50+ years, the first snow each year is still magical and there is nothing like the stark beauty of a crisp winter day. I just experienced a snow day and it was everything you described: hunkered down in a cozy house, watching the snow stick to each branch of the trees, a pot of soup simmering on the stove, the rest of the world seemingly remote. Never considered why winter is my favorite season, but this essay may just have explained it. Hello from Nova Scotia, Canada. I too relish the fluffy white stuff and the dramatic shadows that are cast on the the snow covered trees. I still enjoy the tranquility of sipping hot chocolate with a dash of Irish cream from a thermos while sitting on a snowy trail. However, over the past 10 years our beautiful sunny, snowy, days have morphed with climate change. Now our winters consist of many more grey, wet/icy weather which drags on the spirit and can make everything seem a bit grubby. I now relish any opportunity to go south during these months, However I would not trade our summer and fall days for the heat and humidity of Southern Climates.My motto is everything in moderation …including seasonal weather. I’m with you. Fall and winter are my favorite seasons. They’re for introverts. We’ve lived in the Atlanta area for 30 years (both originally northerners), and I still miss the beauty and quietude of a good snow. My wife, having grown up in northern MN, not so much. ( Of course, the reality of having to be constantly aware of whether the snow is going to prevent you from getting to your job is not fun, and I don’t miss that). If I can’t sleep, I’ll dream about snow scenes from the past and I’ll be sleeping soon. I get the opportunity, when visiting my MN in-laws (whom I love) for Christmas to take a long walk at night in the snow and bracing cold. Of course, we get to leave and go back to temps in the 50s in the ATL area. We get about one or two inches of snow every other year and I go NUTS. I take photos of our house decorated with snow. I’ve been a big fan of Gordon Lightfoot for 40+ years, and I love his songs about nature and the north. ( His “Whispers of the North” is one of my favorite songs). I still long to move north, but my wife won’t hear of it. We can’t afford it anyway. My brother pays $10,000 in taxes per year; we pay about $600 per year, thanks to the largess of our county. We do have fall here, in November, so I get to experience that. And it does get cold here, which energizes me. But, again, it goes away fairly soon. I sometimes imagine being back in the Fox River Valley of IL, or in WI or MN, and I get to visit the northland about seven or eight times a year. A part of me doesn’t want to leave. Spring bums me out, too. That means the 90s and humidity are not far away. Yuck. But, it could be worse. I have a pretty good life in the ATL area. Where I live in the deep, deep South snow days are rare…..maybe once a decade or so. This year we had below freezing temperatures and got iced in. I’m happy to enjoy snow and ice every ten years or so…..that’s enough for me! I don’t need an excuse to stay inside, curled up on the sofa with an afghan, a good book and a cup of hot cocoa or coffee, lol! This southern Californian agrees with you. Winter is not a real season here. Wish it was. In the 20+ years I have lived here I have worn a winter coat maybe three times. I guess we all wish for what we don’t have. 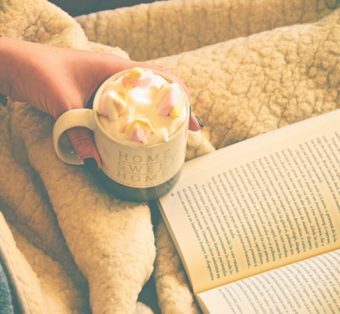 The snuggling in front of a fire with hot chocolate and a book is this introvert’s fantasy! You may call me “Grinch”, but you can have your Winter cozy days here in the North with our week long spells of gloom with no sunshine. You can have the fluffy white snow that turns black and grungy after the second day. You can have the solitude with gray skies, praying for a peek at the sun. You can have your warm snugly sweaters and coats that make you resemble a bear and make it a struggle to get behind the wheel of your car. You can have the below zero wind-whipped temperatures that numb your face and make your teeth ache. I’d trade it all for a few days in January in the sunshine and warmth. Loved your essay! I live in NY and appreciate winter for just those reasons you mentioned… no pressure to be out and about in the sunshine, totally acceptable to stay in with a book, a dog and a cup of tea and a season for the soul to reflect and refresh. Just like a tulip bulb needs the winter months to gain strength for the coming spring… so does this introvert! I live in the north even though I do not like driving in the snow and walking on icy streets and sidewalks, I do appreciate the beauty of the snowfalls we have. Sometimes it looks like a painting it is so beautiful. When it snows a great deal, there is such a silence that comes outside. Snow days are magical for this introvert, but we get just enough of them that they’re not really annoying. My wife and I live in Florida as well and feel exactly the same way. One or two more months of high temps around 60 would be great. Thanks for sharing!